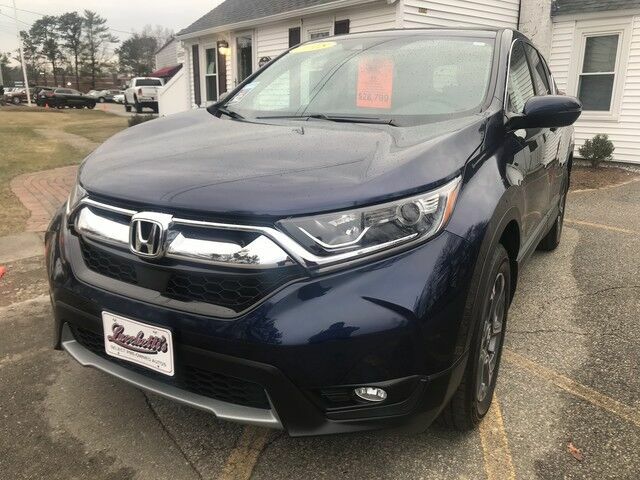 Contact Lucchetti's Auto Center today for information on dozens of vehicles like this 2018 Honda CR-V EX-L. This Honda includes: OBSIDIAN BLUE PEARL BACK UP SENSORS (DIO) REQUIRES Rear Parking Aid GRAY, LEATHER SEAT TRIM *Note - For third party subscriptions or services, please contact the dealer for more information. * When you purchase a vehicle with the CARFAX Buyback Guarantee, you're getting what you paid for. If you're going to purchase a pre-owned vehicle, why wouldn't you purchase one with CARFAX one-owner report. As a Certified Pre-Owned vehicle, this Honda CR-V EX-L offers you the peace of mind because you know it has been rigorously inspected to meet exacting standards. Do so much more with one vehicle. This Honda CR-V gives you everything you need an automobile to be. Start enjoying more time in your new ride and less time at the gas station with this 2018 Honda CR-V. Navigate through all the icky weather with ease in this AWD-equipped Honda CR-V, and even get non-stop traction for your non-stop lifestyle! In addition to the amazing traction control, you may even qualify for an insurance reduction with this AWD vehicle. Marked by excellent quality and features with unmistakable refined leather interior that added value and class to the Honda CR-V This vehicle comes with a navigation system. That doesn't mean you won't get lost. But it does mean you won't stay lost. Clean interior? How about flawless. This Honda CR-V looks like has never been used. Feel pleased in your decision to buy this Honda CR-V as it's still covered under the manufacturer's warranty. Class defining, one-of-a-kind options are the standard with this Honda CR-V plus much, much more.